What Constitutes Fair Use In Articles? There’s an old adage that says, “There is nothing new under the sun.” In other words, everything that you’re doing now has probably been done before by somebody somewhere. Even your freshest, most creative idea is often built on the foundation of what you’ve learned from others. As Expert Authors, this raises a sticky question: When is it okay to borrow another Author’s words, put them in an article and then call the article your own? If you follow our Editorial Guidelines, you know that we will not accept articles that are ripped (aka “borrowed”) in whole or part from another author. However, we know that there are times when including a few lines from somebody else helps to set the stage or add credibility to your article. In those cases, limit that content to only 2-3 lines maximum in your article and be sure to give credit to the original author. Ideally, all content must be original and offer your unique expertise. No one evaluates life and your industry experience like you do. Revere your uniqueness. When in doubt, don’t use any part of the article content of others. To be clear, I’m not talking about using a single sentence quote that reinforces your message. That’s usually ok. I’m talking about not including full sentences or paragraphs of the works of others. Just because something is or isn’t in the public domain, doesn’t mean you have the right to rip it. If you’re new to the concept of FAIR USE DOCTRINE or the limitations on what is and isn’t fair use, study section 107. Every writer should know the concept of what is and isn’t “fair use” at some point in your writing lifetime. Even if you are clear by the letter of the law under FAIR USE doctrine, doesn’t mean we’ll accept your article. We usually look for intent and appropriate use. The acid test: Do we believe the rights holder of the content you’re using will feel like their rights are infringed on? If so, reject. It’s one thing to use content of others under FAIR USE when blogging or posting in a format that isn’t syndicatable, but when your articles go into distribution that you can’t easily control the syndication, you have an added responsibility to NOT include the content of others in your articles. Lastly, if you are going to post your articles elsewhere on the web, we recommend that you add your name to the content to help with your credibility and make it easier for our editors to determine who owns the content (because we do look each time). I’m continuously amazed how many expert authors post their articles on their own website and FAIL to include THEIR NAME on their own articles. This is a red flag for us because it tells us that they are ASHAMED of their content so much that they won’t include their name on it or they didn’t really write it in the first place. It is my contention that you actually can write something totally unique, completely original and even a completely new thought. In fact, I find those my best articles, they make people think and click and check out your website too. I want to be really clear on what I’m understanding you to say here. When I post an article on my website, I don’t sign my name to it, BUT I do have contact info on my site. In other words, there should be never be a question in someone’s mind that the site is mine. All of my sites have an “email me” somewhere and at least my first name is also pretty much all over the place. Do you consider that sufficient, or are you suggesting that each article on our site contain our full name? If your full name as you use it on EzineArticles.com is not the same on your website, we’ll treat your article submissions as suspect. Sometimes an editor can put the pieces together when they find your URL in the Resource Box matches the URL of the website we found the exact same content if your first name is included… but best to put your full name. If you don’t like posting your FULL name on your own website, then I’d recommend using a full name alias all together instead of the grey area of only listing your first name. Looking at your website, you’re black and white enough for me to figure it out so I don’t think you have anything to worry about. I’m not sure I agree with your contention that by not having my name on my article on my own blog, that I’m ashamed of the content or it’s not my own work. First of all, my blog is on a domain name what bears my name. Secondly, when I use quotes from other writers, I include their names and their site or blog names. Thirdly, I make it clear what is my content and what is theirs through the use of text formatting. When I use an article from EzineArticles.com, I give a brief introduction, including the author’s name right up front. But it’s also right under their title in the body of the article. Fourthly, I always point my readers to the original work of an author with a “read the entire article here” link. To make a blanket statement that not putting one’s name on an article, especially on a blog which is a more personal medium — at least mine is — means that we are ashamed of our writing or it isn’t our own is grossly unfair and prejudicial, especially to authors, like me, who create our own content from the ground up! This post made me think about times when our articles are used without our resource boxes – we all know it happens when someone wants to claim authorship and has no guilt about stealing. When you said “add your name to the content” are you suggesting that we somehow work our own names into the body of the article? I never really thought about adding my name to articles on my site, because they’re all mine unless I’ve added someone else’s name. So you gave me something to ponder – again. I’m still not clear on the advisability of posting an article elsewhere when I’ve submitted it to EzineArticles – so haven’t done it. Am I being overly cautious – or silly? Why do people have websites and hide their identity? Seems counter productive to me. You’ve made 4 great arguments. I was really talking about members who really are ashamed to put their name on their own articles. They know who they are. No, I was saying that when you post your own articles on your own website, CLAIM your content by including your name ANYWHERE near your articles on your own website. When we find your article on your website without ANYONES name on it, we wonder why you didn’t take credit for your own article. I’m talking about making it dead simple for anyone to quickly know who wrote your article. With respect to a blogger placing ‘by admin’ on their sites as being silly, actually upon further reflection doing so isn’t quite so silly. Bloggers who create a multitude of niche blogs often times simply do not wish to be known or tracked by their competitors. These blogs are not meant to always lead to a hand holding relationship with visitors but can serve simply as a jumpoff point in helping website visitors find specific information or resources. You guys really tend to be too rigid in your views and over analyze things sometimes. Your argument is that some people hide from the market & their potential customers so that their competitors don’t find out what they are up to? 2) Those who operate with less transparency created to jump the visitor around without building any long-term relationship. If we care about providing our millions of users with a high quality experience, our position is that trust and credibility are ENHANCED when they read an article on EzineArticles by JOHN SMITH and then click to his website to further find JOHN SMITH content, products & services rather than “by: admin”. Oops! All my blogs have this problem – it’s part of the default WordPress installation. Does anyone know how to change it AND make it retroactive (so that is automatically applied to all the older articles)? Calvin, just go into your blog’s admin section and click Users. You can edit the Nickname to whatever you like. I put a bereavement poem I had written on EzineArticles some months ago. The person using it credited it to me but put click through ads all the way through my work. I hated seeing it like that – partly because it does no credit to my copyrighted work, but mainly because the poem was part of a book inspired by my daughter’s death. It was, therefore, very personal to me. To stop this occuring again, I now include a phrase in my resource box saying that my material may be used for non-commercial use only and without any alteration to the format. Take a look and see what you think. I would encourage you to rephrase your resource box to not include the language that your articles “may be used for non-commercial use only”, because we encourage publishers to do otherwise as your articles are for commercial use. You can include in your resource box that you request not to have your article content changed in any way. Although frustrating when it happens to you, reputable publishers will not change the content in your article and per our Publisher Terms of Service we ask them to respect the copyright of your articles by publishing the entire article as is without any changes. 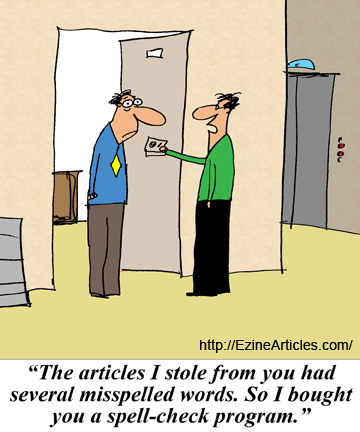 A simple email to the publisher will generally solve the problem if they go against it. Don’t be discouraged by this. Continue to write what you know best. The thing that is missing is the very thing that earned me a reputation in teaching online, at Art Institute Online and Kaplan University. I am a STICKLER for properly citing your resources. My preference is APA but there are other modes of citation. On my blog, I even have a plugin that, at the end of any posting, allows you to choose your preferred method of citation, with the exact manner in which to formulate your list of references. The thing I notice constantly is that indeed, most articles on E.A. and all others, are OPINION. It is as if the directories are so terrified of using other content, they totally ignore THE PROPERLY WRITTEN AND CITED writing. I rarely see resources listed. How are readers to consistently and into the future, supposed to rely on writings such as these? There is a whole history of writing, much of which is either scholarly, technical, or historical in nature, that are written with dozens or even hundreds of cited works. The list of references for some of my Master’s and doctoral papers went on for many pages. This is a NORM in properly written materials. Check out any of the technical sites and their white papers. One main problem is that, outside of academia, the average writer out there does not have a clue about how to put together the cited word within their writing, nor how to tie that to the list of references. And no, that’s not an affiliate link. But I am quite concerned after reading this article, that indeed my observations have been correct. IF you want to really be an “expert,” then you must dive in to what it takes to BE an expert. And part of that is writing in the manner that proves you not only know your material… you also know the history of that knowledge, what may have gone before you, and be able to properly quote the masters who have gone before you in your field of expertise. For E.A. or for any of the directories… I think this must be addressed. It is only in this manner, will readers out there be able to trust the reliability of things they read and/or USE in their own business, from things found in the directories. I would much rather see a properly cited quote from a reliable source, even if it is a paragraph or two… than something that is simply opinion. If a prior expert has given rise to your own knowledge in a matter, then it is entirely proper to include that in your own writing. But you MUST do this properly, or yes…. it can be considered a form of plagiarism. Many of my students, I think, thought me a tyrant on this issue. It took many weeks and many not-good grades. But almost to a one, I was thanked at the end of each course. Most went forward KNOWING how to properly cite their works. I don’t think E.A. or any directory needs to be more lenient on any score. I think they need to actually be more stringent about what makes up a properly formatted writing. This comment is indirectly related to your last point, chris, that people leaving out their names are ashamed of their work or have stolen the article. I, for one, use a pen name because I have a job where I am pretty well-known in my erea, (-it doesn’t pay the bills too well, it only get me prestige) and putting in my real name would grant me loads of comments, not all of them friendly. So I use a pen name. Still in all, I would use that same pen name on my blog. A simple workaround is to post on EzineArticles before you post on your blog, this way the editors will not see it anywhere else. once it’s live on EzineArticles you can post on your blog.